ganda ng closing price today Mam. (07-08-2011, 12:16 PM)abundance boy Wrote: ganda ng closing price today Mam. Bulls are fighting the bears. Nice, nag paparamdam na rin ito. Parang gusto ko bumisita sa mall nila bukas ah... ahaha! greetings to all, want to share my analysis on FDC. with the market hitting highs and almost all bluechips/2ndliners already fully valued (if not overvalued).. only a handful remains to be considered "safe" buys..
below is my analysis on the NAV contribution of FDC.. just FLI/FAI alone is bigger than current FDC market cap..
saw the recently published study by COL on FLI..
Upside potential of 40% to reach book value, could be more if the float is increased allowing fundies participation..
ahmmm... di po ba sir sa July 14 na ang payable date ng cash div nito? so, it will go down on a bit Thurs *which is a buying opportunity*...? 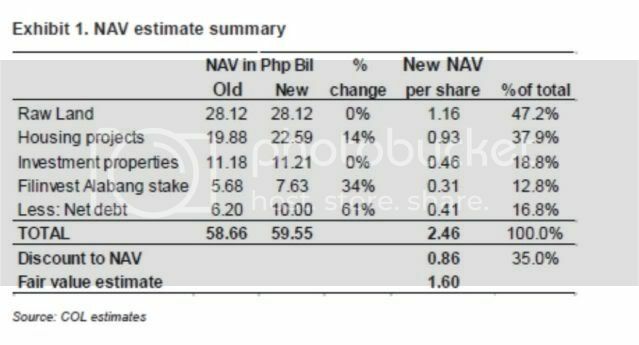 MANILA, Philippines - Gotianun-led holding firm Filinvest Development Corp. (FDC) posted a 26% growth in its first-half net income to P2.38 billion on higher revenues from its property and banking units, and cost efficiency. FDC said revenues for the first six months of 2011 reached P10.58 billion, 21% higher than the P8.7 billion recorded last year. Real estate operations, consisting of condominium and lot sales, and mall and office rental income, accounted for P5.9 billion of revenues, up 51% from last year. FDC's property arm, Filinvest Land Inc., announced 17 new projects and 24 additional phases for launching in 2011. Meanwhile, FDC's banking operations under East West Bank contributed P4.15 billion to total revenues as it booked operating income of P3.4 billion, largely from lending. FDC said effective management of costs also boosted its profits, with its operating expenses increasing by just 3% in the first half. (07-11-2011, 11:21 PM)Luc23 Wrote: ahmmm... di po ba sir sa July 14 na ang payable date ng cash div nito? so, it will go down on a bit Thurs *which is a buying opportunity*...? Pag ex-date yun applicable. 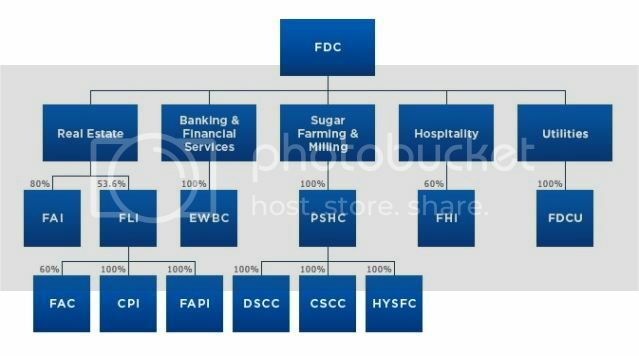 Date payable is when FDC is going to pay the stockholders on record as of the cut-off date which is the ex-date last June 16, 2011. Thank you for sharing your FA. FILINVEST Development Corp. (FDC) is issuing 49.8 million common shares as part of a postponed multibillion-peso equity top-up offering that will be undertaken in tranches. FDC told the Philippine Stock Exchange (PSE) on Monday that it signed a subscription agreement with parent firm ALG Holdings Corp. covering the issuance of new shares priced at P5 each to raise a total of P249 million. The company said the shares will be paid on July 26. FDC shares slid 1 percent to P4.95 each on Monday’s close. The company earlier postponed the sale of at least 2.5 billion new shares plus overallotments early this year given unattractive valuations arising from volatile market conditions. In May, FDC president and chief executive officer Lourdes Yap said the company will proceed with the issuance, but this will now be implemented over several tranches so it can “optimize” the share price. FDC is raising funds to finance its diversification into power generation and to meet the 10-percent minimum free-float requirement of the PSE by the end of the year. The company’s current public float stands at 7.7 percent. BusinessMirror calculations, however, showed that the issuance of 49.8 million shares would not be enough to meet the PSE rule. FDC said its venture into power will involve the construction of liquefied natural gas-fired power plants with a total capacity of 1,650 megawatts set to go online starting 2014. The company recently reported that net income during the first half of 2011 rose by 26 percent to P2.38 billion compared with the same period last year, lifted by its core real estate and banking units. It said consolidated revenues during the period also increased 21 percent to P8.7 billion. EASTWEST Banking Corp. said it plans to undertake an initial public offering (IPO) as early next year. Current time: 04-21-2019, 03:32 PM Powered By MyBB, © 2002-2019 MyBB Group.